The 10 Best Noodle Places in Utah! Whether you’re craving a light and refreshing ramen or you’re more in the mood for a hearty bowl of pad Thai, Utah has an array of excellent options. From vegetarian-friendly dishes to soups complemented by beef or chicken, here are the 10 best places for noodles in Utah. As the restaurant’s name suggests, Tonkotsu Ramen Bar is pretty obsessed with ramen. And although if you come here, you should definitely prioritize its ramen options, the restaurant also has myriad menu items for those who’d like to try something else. The rice bowls, rice plates, and appetizers (most of which at least feature classic ramen flavors) serve as great accompaniments to the main attraction. Located in downtown Salt Lake City, Sawadee receives a lot of traffic, but not only because of the restaurant’s location. Sawadee is often praised as some of the best—and most authentic—Thai food in Utah. With lunch, dinner, and vegetarian menus, the restaurant highlights the versatility of Thai food, as well as the deliciousness of Thai noodle dishes. Whether the refreshing glass noodle salad or the pad Thai piques your interest, you and your fellow noodle lovers will not be disappointed. Pho 33 doesn’t have to be flashy, simply because it lets its food do the talking. This restaurant’s pho could legitimately sooth your soul. If you’re not into pho, you can also try one of the restaurant’s “hot wok noodle” plates, which feature double pan-fried noodles and smoky meat and vegetables. Krua Thai Restaurant deserves an A+ in friendliness, and a comparable grade for its food. It’s menu is divided into two separate parts: an exclusive lunch menu and an all-day menu, both of which make noodles the star of myriad delicious dishes. 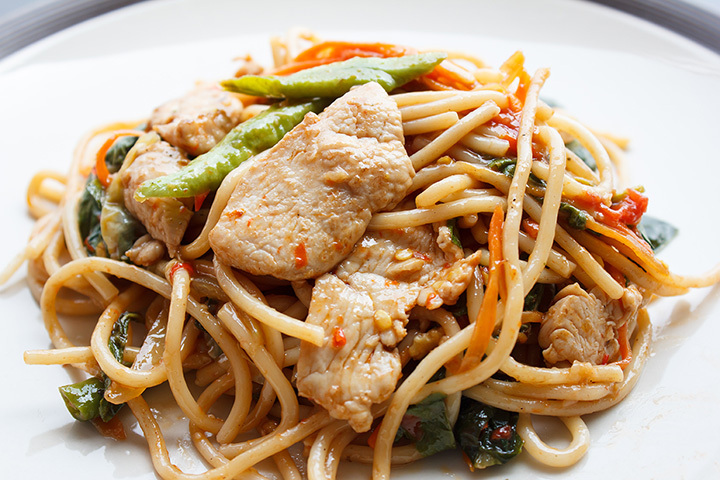 That said, you can also choose from an impressive selection of Thai curries and stir-fries. Some say Little Saigon has the best pho in Salt Lake City, which is a pretty bold claim, especially considering how many pho restaurants call Salt Lake City home. While Little Saigon sells a variety of interesting, Vietnamese-inspired dishes (think Vietnamese tacos and banh mi sandwiches), a majority of its menu is noodle-centered. At Little Saigon, you can choose from vermicelli noodle dishes, pho, and lo mein to calm your ever-raging carb cravings. Haru Ramen keeps its menu simple and classically Japanese, which is a gift for ramen lovers and ramen newbies alike. The inconspicuous menu highlights classic Japanese flavors and ingredients, including both ramen and udon noodle dishes. If you have the stomach space, make sure not to miss out on the restaurant’s refreshing desserts. Yet another Salt Lake City Thai restaurant, Mano Thai Diner nevertheless deserves a place on this list because of its cult following and delicious food. For noodle fanatics, Mano Thai Diner is a must-try, because the restaurant even has a separate menu dedicated solely to noodle dishes. What’s more, it’s likely that you’ve never heard of a majority of the dishes, because this restaurant goes above and beyond standard classics such as pad Thai. You’d be hard-pressed to find anyone who had something negative to say about La-Cai Noodle House. How does a restaurant develop such a remarkable reputation? Consistent deliciousness, along with great, friendly service. The inside is clean and comfortable, and the noodles relished inside the restaurant’s walls are well worth your attention. Shoga is a sophisticated Asian restaurant in an unassuming strip mall. And Shoga’s food is delicious. Although its range of noodle dishes is somewhat small in comparison to other restaurants’, the noodle dishes it does offer are notably varied. You can order ramen, tempura udon soup, niku udon soup, nabiyaki udon soup, and/or satisfying yakisoba.